Designed with plumbers and other water and waste management specialists in mind, Plumbing is a premium child theme for Divi that helps companies bypass web design and development processes in order to help them begin advertising their services and attract new customers. Plumbing includes a range of premium features including a login customizer, a 404 error page template, as well as the Aspen Footer Editor plugin. 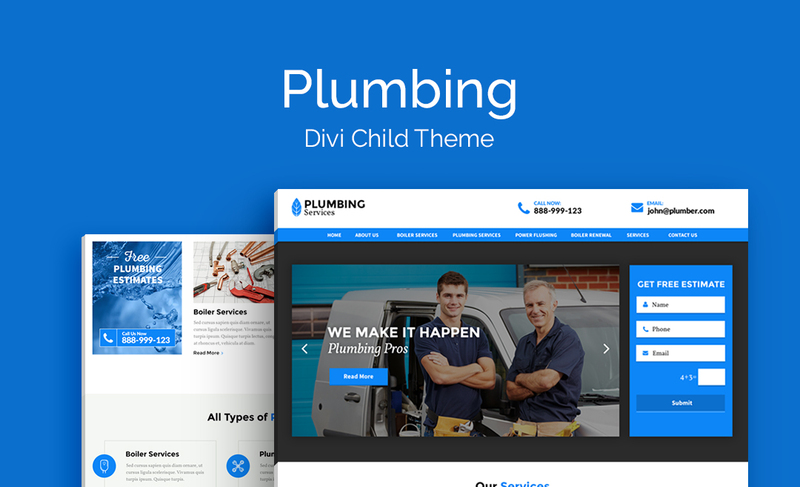 Forming part of the Service Themes collection, Plumbing is a premium Divi child theme developed specifically for independent plumbers or plumbing companies operating in the greater water and waste management industry. Boasting an attractive design that cleverly balances white space with striking image sections, Plumbing sees a neutral color palette come to life with vibrant blue color accents. This, teamed with elegant font pairings and subtle hover animations across the build, deliver a slick and professional website aesthetic. Developed with the aim of assisting service professionals in attracting and converting new customers, Plumbing offers a plethora of enticing site visitor interaction sections. As well as displaying ample contact details throughout the site, Plumbing also includes prominent call-to-action modules that offer viewers both the opportunity to make contact or request a cost estimate with the service provider. 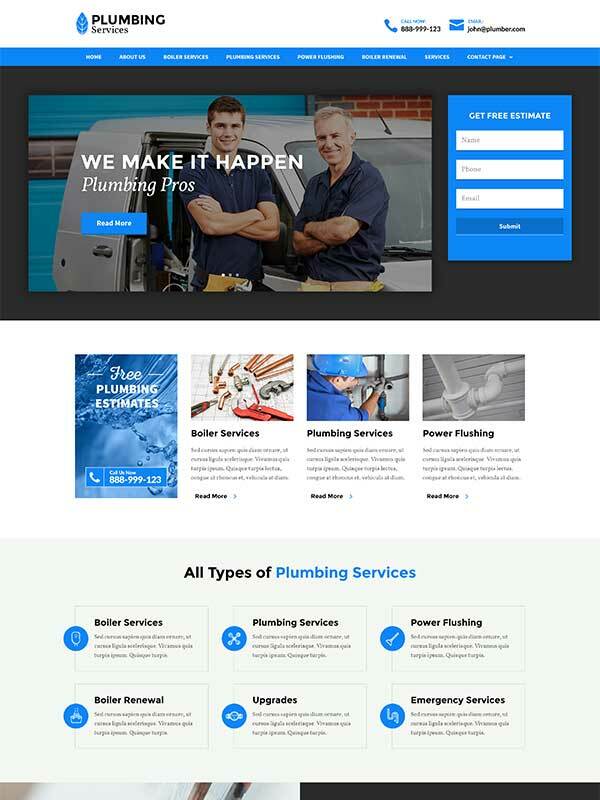 As well as an attractive About page, two Contact page variations and a page to list various services, the Plumbing child theme for Divi ships with a number of sub-pages that make it easy for plumbers and plumbing companies to showcase their various disciplines and too, offer information as to how they can be of service to those that require help and advice. To attract new customers even further, the Plumbing Divi child theme includes a number of areas wherein users can enter their customer feedback and testimonials to encourage trust through credibility and social proof. Finally, the Plumbing child theme ships with a number of premium features including the Aspen Footer Editor (to style out a site-wide footer area), a Login Customizer (to customize the default wp-admin login page) as well as a 404 Error Page template settings (to create an error redirect page). Note: Plumbing ships with a one-click install process. Plumbing includes demo imagery sourced via Pexels and/or Unsplash and is free to use in accordance with the Creative Commons Zero license. Our dedicated full-time support staff is here to help if you run into any problems or have any questions. Our fast, knowledgeable service is one of the reasons our customers love us. Annual Membership – $149.00Get ALL of our products (courses excluded) with an Annual Membership! All price options are billed annually (except for Lifetime Membership). You may cancel your subscription at any time. Products subject to a yearly license for support and updates. View terms. Stay up to date with the latest Divi Space news, updates, special offers and more! Don’t leave before entering to win an iPad Pro! It’s Free! You may be too early for our Black Friday specials, but you can still enter our competition! Leave your details below and you could win an iPad Pro! Great you've entered our giveaway! Only one step remaining! Please check your email and confirm it.